A very sweet girl named Iva was passed along to me through a good friend of mine. She was having a very special engagement party and wanted to surprise her lucky fiance with a cool cake to represent their upcoming nuptials. Iva and I worked closely together to come up with the following cake design. For the center tier I borrowed the idea from Erica O’brien who is a very well known cake designer in the industry. I was very lucky a few years ago to take a fondant class from her when she moved to CT. Check out her site here. Her designs are one of a kind and incredible. The top of the cake sat two cute love birds that was a bride with flower head piece and groom with top hat. The next tier was polka “dots” that were little black flowers. Next was an ombre ruffle red heart that added great dimension. 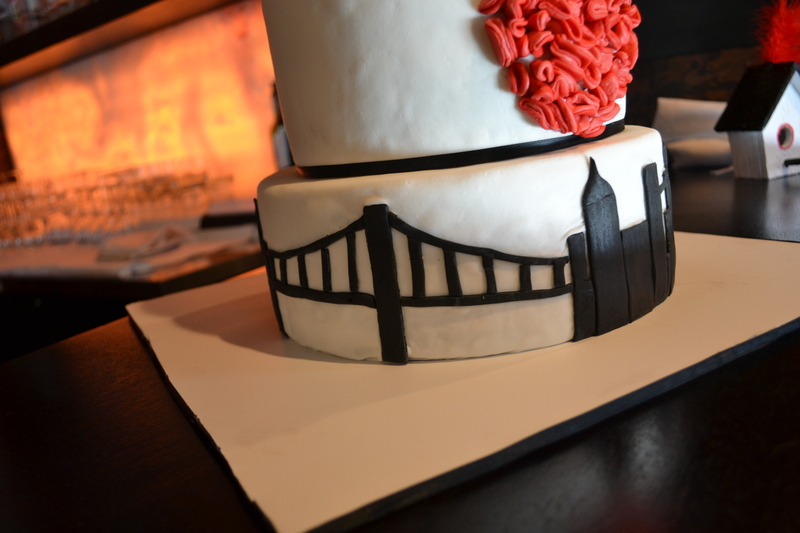 Finally, the NYC city skyline that really represented the couple and their love. 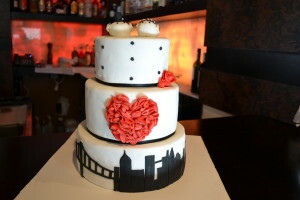 We felt that this was a chic and modern cake that also displayed the love they were celebrating. The top tier was a red velvet cake with cream cheese filling, then a vanilla cake with a chocolate buttercream filling, and finally the bottom tier with chocolate cake with raspberry buttercream filling. All of the cake tiers were covered with a homemade marshmallow fondant. Congratulations to Iva! I know your wedding will a wonderful day that you will always remember. 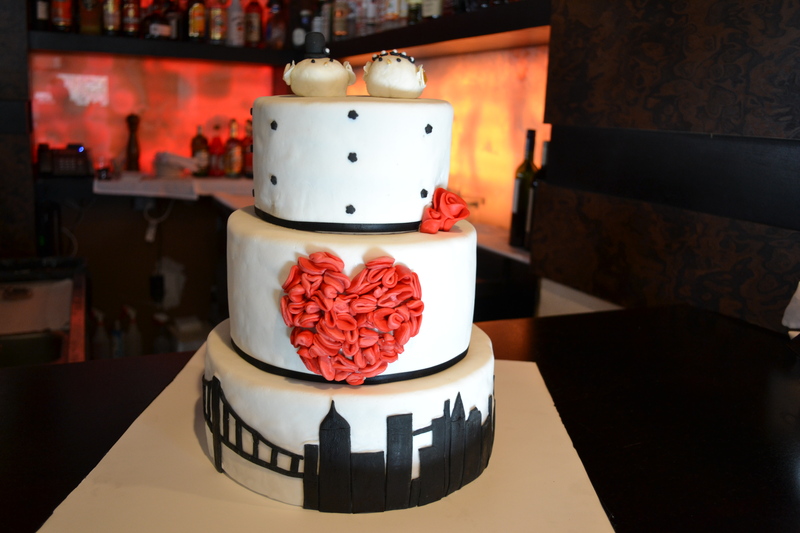 A special message from Iva – “The cake was BEAUTIFUL. Everyone loved it… and it was delicious too! Got a lot of compliments!! !